When you’re a kid with an ‘unusual’ name, it can be hard to find a bicycle plate, mug, keychain, or most other tchotchke type things with your name engraved on it. Little Anjali in the book Always Anjali encounters this dilemma when she can’t find a bicycle plate with her name. She asks why her name isn’t “normal,” like everyone else’s. Author Sheetal Sheth is an acclaimed actress in the United States. 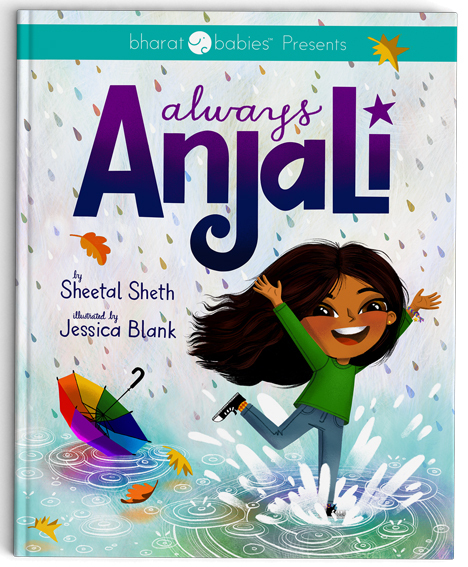 Her book, Always Anjali, is about a girl who gets bullied for being ‘different’ and when her parents refuse to change her name, she learns about her roots and finds power in being authentic. Sheetal sat down for an interview with Book Riot, with a pleasant lilt in her voice and good cheer. “It’s really about a girl who has to embrace that being an individual is her superpower,” she explains. Sheetal’s childhood and start to her acting career provided inspiration for the book; she first starred in the film ABCD alongside Aasif Mandvi and Madhur Jaffrey. When first entering the business, she was often asked which of her names she was going to change. With this reflection, I asked Sheetal if this experience was common-place, the experience of having an unusual name and wishing to change it. We then talked about Sheetal doing the audiobook for Afterworlds by Scott Westerfeld and voice work on the film Life of Pi directed by Ang Lee. Afterworlds also happens to be one of my favorite books about the American Desi (Indian) experience. We then talked about Sheetal’s film career, and about the recent allegations that have come out of Hollywood. Bollywood in the meantime may be on the horizon, since they have approached her several times. The conversation turns serious when we discuss harassment and assault. Sheetal believes that we can be allies. That there should be due process and that we need to allow a safe place for people to come forward. She also believes in redemption as long as perpetrators have had consequences for these actions. Going to a lighter topic, I ask about the journey to publication and how Always Anjali found a place at Bharat Babies. “We pitched a lot of places. The feedback varied and it was really about finding a partner who shared my vision and understood what I was trying to do,” she explains. “I think lessons are better learned through experience. Stories where you root for the characters. I like the subtle. When I read the feedback from Bharat Babies, I was so pleased that they got the nuance. They made the book better with their thoughts. My conversations with the Bharat Babies team excited me. By the way, they’re also all women and they’re hungry. They are willing to roll up their sleeves and do the work. In fact, they were already doing it. I love that energy. Sheetal has also said there will be a series about Anjali, with Always Anjali being the first. She has the first 4 books mapped out. “It’s very important to me to have created a character like her. A lot of books [about South Asians] focus on a holiday, religion, or arranged marriage. I wanted to create a character that was just a girl. It’s not just about her race. Why can’t all those books about a kid and their dog be a brown kid? I ask Sheetal how she thinks Desi authors can do better at telling their stories, and to increase their presence in American literature. To close off our interview, I asked Sheetal what her ideal book for a growing Indian girl would be. “I’m still figuring that out myself,” she admits. “I’m cultivating a library of books for myself and my girls. It’s all about the narrative and the images. And presenting a broad array of characters and experience from different backgrounds and perspectives. Normalizing the inclusive. And if you tell me ‘this is a great book for a girl,’ I’ll probably chuckle and move on. That language makes me crazy.” It’s a question that will remain ongoing, to fill our libraries with books meant for our children and to help them grow. Always Anjali will enter the world on May 12 2018. Be sure to preorder or pick up a copy!